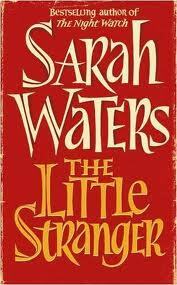 The Little Stranger by Sarah Waters was a book club read I was looking forward to reading, but which I ended up struggling to finish. I’ll admit I had just over 100 pages to go and gave up, but I probably would have struggled on while falling asleep if it was not for the book club and finding out that there really isn’t any resolution at the end. The novel has been short listed for an award and there are some aspects of it which I can see the award for, but otherwise I have to stretch my theories on that one a bit. My feeling for it is that Waters captured the era and language perfectly for the time setting (1940’s) and embodied the caste system in that time and place, but I felt the story was lacking. The tension and interest created was somewhat of a roller coaster. First I’m enjoying it and expecting something to happen, only for whatever it was to happen and then become resolved by the narrator. This was a quarter into the story after which it petered out, levelled off, only to start building up to something before being resolved once again. The build up and resolution phenomenon happened more so because the narrator is a doctor and adamant on a scientific explanation which makes sense, but at the same time before you start reading you’re led to believe this is a ghost story. So you’ve got the side characters buying the doctor’s explanation for the most part and yet you’re expecting someone at some point, namely the doctor, to come out with something that has to do with the paranormal. What is the good doctor’s explanation each time? The house is falling apart, everyone is stressed, women’s hysteria, mental illness, the maid wanting attention and playing games. I recommend that if you read this book to not expect a ghost story. Do not read it for a ghost story because when it comes down to it, it is more about the caste system and the fall of an upper class society back in the 1940’s rather than a good thrilling ghost story. One more thing about The Little Stranger I’d like to point out for unsuspecting readers. If you compare a lot of classic literature to modern literature you might notice that classic literature was written with a message in mind and accompanied with a plot. Whereas modern literature is more so focused around a plot accompanied with a message (I happen to believe every story has a message even when you aren’t planning for it). The Little Stranger had me ponder this the whole time I was reading. Why? Because it is a mixture of both, as if she was aiming for one and somewhere along the line decided to change over to the other, but in so doing lost a crucial foundation of the story. Whether that did occur or not, I don’t know, but that is the impression I got from it. Reminds Me Of: Burmese Days by George Orwell in writing style, but drier. Ironic! I just saw in this library on the “Halloween Reads” shelf and I wanted to read it. Now, I think I’ll pass…so thanks so much for the review so now I have time to read something else! I can’t get over how much and how often that book is listed as something supernatural or horror. It really is ridiculous how much people have been misled. Sure it has a supernatural element to it, but it doesn’t necessarily mean it is that sort of novel at all. I just hope that doesn’t show what her other books are like as well.